FAQ-Why should I use stamp tongs? If you are going to invest in a hobby like stamp collecting, it only makes sense to take care of it. One of the worst things you could do when sorting and handling your stamps is to use your bare hands and fingers. Even if you wash your hands properly, you still risk transferring oils from your skin to your stamps. It may not seem like such a big deal, I mean, most stamps have been handled at some point, right? However, you may not feel the same if you leave a big, nasty fingerprint on a valuable stamp. Stamp tongs have been specially designed to help collectors pick up and move their stamps around without damaging them. They are especially useful when handling older, delicate stamps. I have personally torn older stamps when picking them up by hand (thankfully, they weren’t valuable). And even if you don’t tear them, there is the very real possibility than you will accidentally crease or fold them. As mentioned before, skin oils can be a big problem when handling stamps. We all perspire and it is very easy to leave a slight stain on stamps. Especially on a mint, gummed stamp. Once a stamp is stained with oil, it is stained forever. Conduct your own experiment: do a few chores around the house and then pick up a mint stamp between two fingers-chances are you have left a fingerprint in oil on the back gummed side of that stamp. Lesson: no matter how much you wash your hands, they can get sweaty after a while and do damage to your stamps. And damage to stamps means their value is reduced! Besides helping you to avoid damage, stamp tongs are just plain useful. Ever tried filling a stock book with hundreds of stamps that you are picking up with your fingers? Torture! Try the same task with tongs and you will understand why they are a necessity. They slide under stamps effortlessly and make them easy to pick up and place in an album, stockbook or stamp mount. Here at Arpin Philately, we always use stamp tongs to place our stamps in the index cards we ship them in. I can honestly say from experience that this job would take a whole lot longer if we were not using stamp tongs. There are different styles of tongs available. 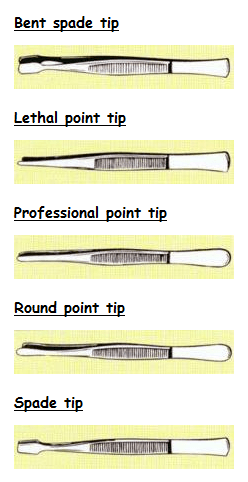 I personally like the spade point and the professional tip. To be very honest the «lethal» point tongs scare me; I’m afraid of poking a hole in thinner stamps. So, if you choose that one, use it carefully. At Arpin Philately, we have such reasonable prices, you can try out different tongs until you find the one that suits you perfectly. No self-respecting stamp collector is ever without his stamp tongs! Shop for stamp tongs at Arpin Philately. Note: NEVER NEVER use ordinary tweezers to handle stamps. Tweezers, such as the ones used to pluck eyebrows, have sharpened tips and are grooved along their inside edges. These grooves could easily tear your stamps. FAQ-Is a stamp catalogue really necessary? 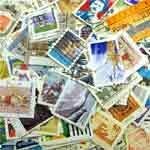 FAQ-How to care for your stamps properly?